A man beating a length of twisted leather cord against a branch near to a small cattle pen at a homestead, with a dog walking past him. Such carefully made cord may be used to place around the neck of a favourite ox. Note on print reverse ms pencil - "2 189 "
Morton, Chris. 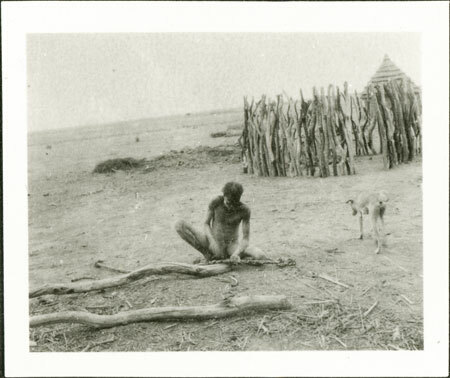 "Nuer man making cord" Southern Sudan Project (in development). 03 Jan. 2006. Pitt Rivers Museum. <http://southernsudan.prm.ox.ac.uk/details/1998.346.189.2/>.